tl;dr: Data from thousands of non-retracted articles indicate that experiments published in higher-ranking journals are less reliable than those reported in ‘lesser’ journals. Vox health reporter Julia Belluz has recently covered the reliability of peer-review. In her follow-up piece, she asked “Do prestigious science journals attract bad science?“. However, she only covered the data on retractions, not the much less confounded data on the remaining, non-retracted literature. It is indeed interesting how everyone seems to be attracted to the retraction data like a moth to the flame. Perhaps it’s because retractions constitute a form of ‘capital punishment’, they seem to reek of misconduct or outright fraud, which is probably why everybody becomes so attracted – and not just journalists, scientists as well, I must say. In an email, she explained that for a lay audience, retractions are of course much easier to grasp than complicated, often statistical concepts and data. II. This already unrepresentative, small sample is further confounded by error-detection variables that are hard to trace. Anyway, because of these considerations, the majority of our article is actually about the data concerning the non-retracted literature (i.e., the other 99.95%). In contrast to retractions, these data do not suffer from any of the above two limitations: we have millions and millions of papers to analyze and since all of them are still public, there is no systemic problem of error-detection confounds. Hence, even if you completely ignore the highly scattered and confounded retraction data, experiments published in higher ranking journals are still less reliable than those published in lower ranking journals – and error-detection or scrutiny has nothing to do with it. In that view, one may interpret the observation of more retractions in higher ranking journals as merely a logical consequence of the worse methodology there, nothing more. This effect may then, in turn, be somewhat exaggerated because of higher scrutiny, but we don’t have any data on that. 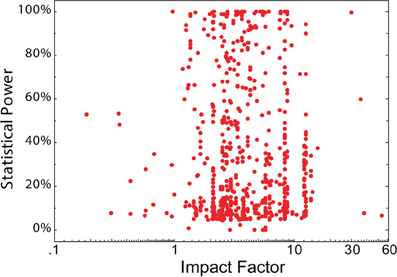 The authors speculate that the correlation they found is due to higher ranking journals publishing larger gene collections. This explanation, if correct, would suggest that, on average, error detection in such journals is at least not superior to that in other journals. Thus, there are at least three additional measures in these articles that provide additional evidence supporting the interpretation that the highest ranking journals publish the least reliable science. UPDATE II (9/5/2017): Since the last update, there has been at least one additional study comparing the work in journals with different impact factors. In the latest work, the authors compared the p-values in two different psychology journals for signs of p-hacking and other questionable research practices. 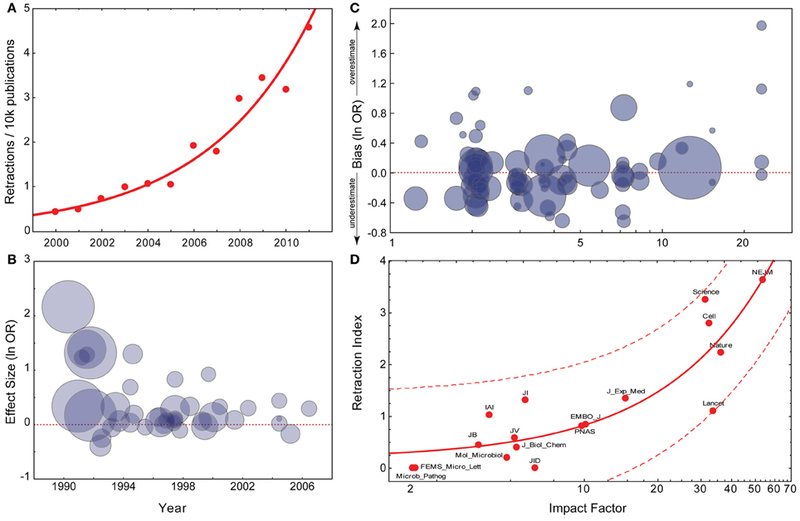 Dovetailing the data available so far, the authors find that the journal with the higher impact factor (5.0) contained more such indicators, i.e., showed more signs for questionable research practices than the journal with a lower impact factor (0.8). Apparently, every new study reveals yet another filed and yet another metric in which high-ranking journals fail to provide any evidence for their high rank. UPDATE III (07/03/2018): An edited and peer-reviewed version of this post is now available as a scholarly journal article.